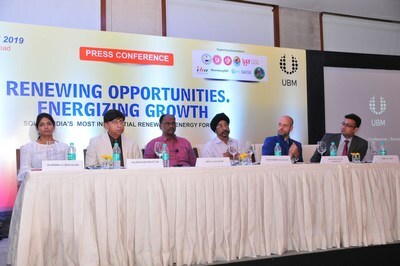 UBM India, the leading B2B exhibitions organiser announced the fourth edition of RenewX, a 2-day Renewable Energy trade expo slated on April 26 and 27, 2019 at the Hitex, Hyderabad. Augmented further by the legacy of its flagship show, Renewable Energy India Expo (REI India), UBM India through RenewX 2019, will provide an industry platform for organizations to capitalize and penetrate into the burgeoning South Indian renewable energy market. The expo will witness a congregation of South India's green economy community to discuss industry trends, challenges and market insights. RenewX 2019 is supported by a host of key associations such as Telangana State Renewable Energy Development Corporation Ltd. (TSREDCO), Indian Biogas Association (IBA), ELIAP, TELMA, KRESMA, Bloomberg NEF and IGEF. The expo aims to bring together decision makers from RE sector, manufacturers, industrial consumers, facility managers, energy and financial consultants, IPPs, EPCs, distributors/ dealers, system installers and integrators, ministry officials, regulatory bodies, municipalities, utilities & project developers and planners, investors, fund managers, bankers, project developers, and R&D officials. RenewX 2019 will witness over 100 participating exhibitors endeavouring to make a difference in the renewable energy domain of South India including Jinko Solar, Waaree Energies, Goldi Solar, Polycab, Canadian Solar, Premier Solar, Havells, Bergen Associates, Exide industry, Sri Savitr Solar, Longi Solar, Radite Energy, Solis Inverter, Consulate General of Belgium, SolarEdge Technologies and Enerparc Energy. Representation from State Nodal Agency along with a Belgium Pavilion and Solar Skilling Competition are some of the anticipated highlights at RenewX 2019 edition. Speaking on the announcement, Mr. Yogesh Mudras, Managing Director, UBM India said, "As of last year, South India generates half of the country's renewable energy power, with Telangana itself having a vast solar potential estimated at 20.41 GW and a wind Energy potential of 4.2 GW. The state government has also implemented the decentralized Distributed Model which makes project approvals a time-bound, well-defined process, and providing for a number of favourable regulations relating to net metering, open access, feed-in-tariff and grid-related interventions." He added, "Yet, recent reports suggest that for MSMEs, limited access to finance, need to strengthen awareness, and escalating energy expenses are impacting the long-term profitability, competitiveness, and sustainability of the sector. It is here that the RenewX show will play a significant role to accelerate the growth of Renewable Energy Industry especially in South India and contribute to the country's sustainable economic development. This year, we have eye-catching innovations such as the German made PV Port and Store on display, a path-breaking tie-up with the Consulate of Belgium for technology and knowledge sharing seminars and trade benefits, the 'Solar Skilling Competition' in association with Skill Council for Green Jobs and the 'Skills - On - Wheels', a mobile van to empower Rural Youth which is an initiative by Steinbeis Academy of Germany and Telangana Government to bring in due diligence and quality to the sector." Aiming to provide an excellent platform for Stakeholder's networking and capitalize into the lucrative South Indian market to accelerate the growth agenda, RenewX 2019 includes the Solar Skills Competition, in association with Skill Council for Green Jobs. The competition focuses on Health & Safety aspects of workmanship, accuracy & installation procedures and technical briefing by industry experts. The event will also showcase the sectoral commitment towards 'Skill India' mission, a Government of India Initiative. A two-day dedicated conference on 'Golden Age of South India, Creating Customer Connections' will talk about successful practices on integrating Renewables into business, and to find the best working models and practices for the South Indian RE market that can lead to increased efficiency while optimising cost in the rooftop segment covering various aspects of the entire value chain. Importance of Bioenergy in the renewable energy mix for India's present and future - Waste is not a waste until wasted! Key speakers at the conference include Sri Ajay Mishra, IAS, Spl. Chief Secretary, Govt of Telangana; Sri G. Raghuma Reddy, CMD, Telangana State Southern Power Distribution Company Limited; Sri N Janaiah, VC & MD - TSREDCO (Telangana State Renewable Energy Development & Corporation); Ms Farzana Rahman, Sr VP - IDCOL, Bangladesh; Jean-Francois Aernouts, Trade Commissioner, Consulate General of Belgium; Sreyamsa Bairiganjan, RE Expert from World Bank; Joerg Gaebler, Principal Advisor, GIZ; Tobias Winter, Director, Indo-German Energy Forum Support Office; Stefan Schaefer, CEO Expectus GmbH; Dr Christoph Mueller, CEO Simply Solar; P. Vinay Kumar, CEO, Varp Power Pvt Limited; Manash Mitra, Head -Advisory and M&A, Tata Cleantech Capital Ltd; Radhika Choudary, Co- Founder Freyr Energy; Shashidhara BV, Head Solar Edge-India; M.R. Narayanan, Chairman, Adtech Systems Limited; Kelly Mermuys, Country Manager, 3E (SynaptiQ Solar & Wind); Santosh Khatesal, Managing Director, Enerparc; Daniel Liu, Managing Director, South Asia, Jinko Solar; Dinesh Salem-Natarajan, Co-Founder SootLess Energy Private Limited; Thorben Glaser, Project Manager, KfW; and Uday Kiran, Director, Infrastructure, Government & Healthcare, KPMG, among others. RenewX is organized by UBM, which in June 2018 combined with Informa PLC to become a leading B2B information services group and the largest B2B Events organiser in the world. Please visit https://www.renewx.in/ for more information on the CJGF and www.ubm.com/global-reach/ubm-asia for our presence in Asia.